Carrier 7.5 ton Model 48TFE008611, 460 volt, 3 phase, manufactured in 2002 operating o.k. when removed. Asking $1500, will consider reasonable offer. 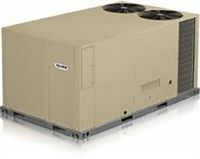 Lennox 3 ton Roof Top Unit, Model LGA036H2BS2G, 460 Volt, 3 phase with economizer. Manufactured in 2004, this unit ran good when removed to reconfigure a retail space. Asking $1500, will consider reasonable offer.